Have you ever wondered what Disney’s two water parks have to offer? Wonder no more as we dive head first into all the features and fun you can find at Blizzard Beach and Typhoon Lagoon! Join us this week as we play the fun “Never Have I Ever” game, Disney style! No, I’m not here to teach you how to swim. If you’re like the majority of people, you’ll want to swim sometime during your Disney vacation. I’ve got some hints for you to make your experience more magical! 1. Pack your swim suit in your carry on bag. Most people don’t think about this when they’re packing their suitcase, but it’s key if you’re arriving early and plan on swimming soon after arrival. If you’re using Disney’s Magical Express from the Orlando airport, it can take a few hours for the luggage service to deliver your bags to your room. If you’ve thought to pack your swim suit in your carry on bag, the fun can start right away! 2. You forgot your swim suit (or your kid’s suit). Don’t fret if you’ve forgotten your suit! Most of the resort gift shops carry a limited assortment of swim gear and you may be able to find what you need there. If not, there are shops at Disney Springs or you can take a taxi/Uber to the nearest store to get one if you have to. 3. My kid needs a floatation device! No worries if you’ve got a little one who can’t swim yet. Disney provides an assortment of swim vests for children at no charge. Just grab one off the rack and replace it when you’re finished. 4. Don’t forget the sunscreen! You’ll want to remember to pack the sunscreen in your carry on with the swim suits. It’s very important in sunny Florida! If you forget, they do have some for sale in the resort gift shops. 5. 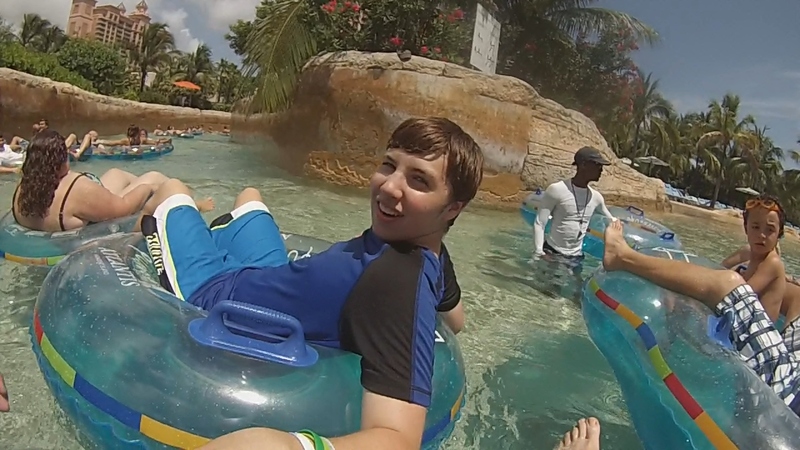 Disney pools are awesome! Disney has some really fun pools on property. A few of our favorites include Stormalong Bay at Yacht/Beach Club, the volcano pool at Polynesian, The Big Blue Pool at Art of Animation, and Ol Man Island at Port Orleans Riverside. They have daily activities for families poolside every day (weather permitting). These include things like dance parties, hula hoop competitions, trivia and more. All Disney pools have lifeguards on duty for extra safety. 6. My toddler is too small for the big pool. Totally fine! Many of the Disney resorts have splash zone areas for the smaller children to have some water fun too! 7. The pools aren’t extreme enough for me. Fair enough. 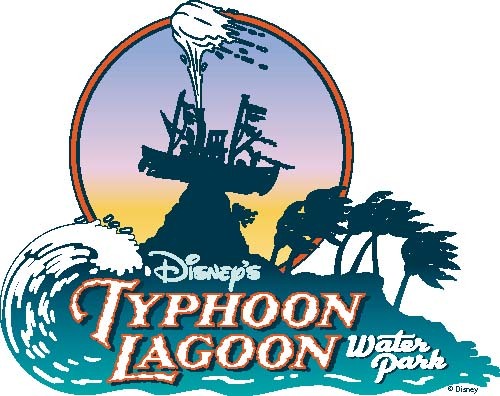 You should try out the two water parks on Disney property: Typhoon Lagoon and Blizzard Beach. These parks have thrilling water slides, wave pools, lazy rivers, kids’ areas, and more! Here is the latest list of refurbishments and closures at Walt Disney World for Fall 2015. This is subject to change at any time so check back. 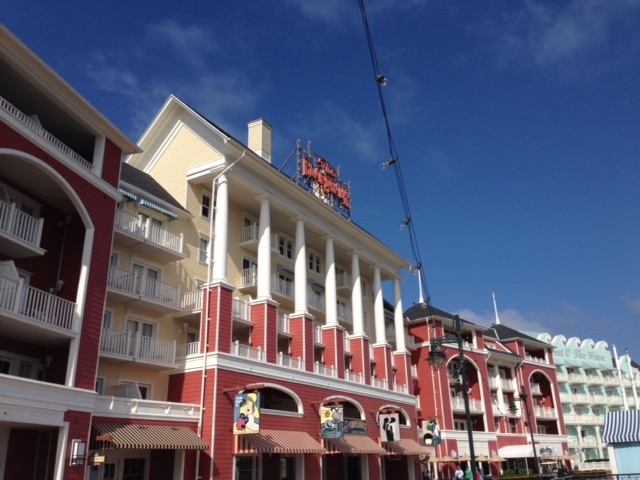 Last July, I went on my first Disney Cruise with my two tween sons and my two best friends. There were many decisions and choices to make and excursions were no exception! We did the 4-night cruise on the Disney Dream with a stop in Nassau, Bahamas. 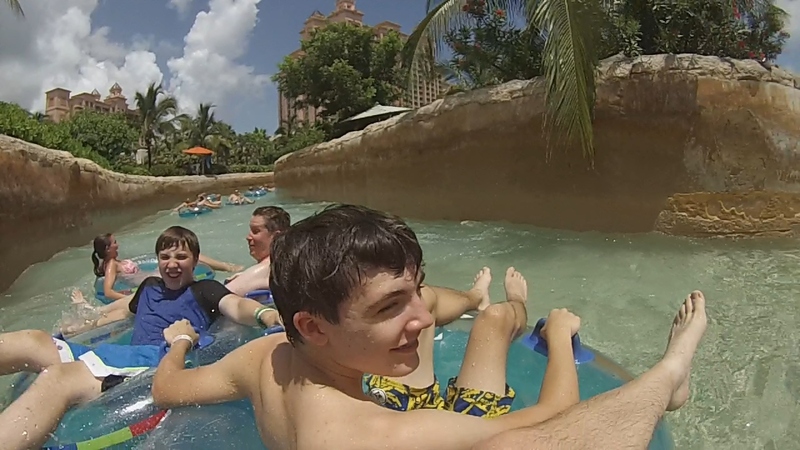 After reviewing all of the excursion choices, my boys said that they really wanted to see Atlantis (probably based on all of the TV commercials they had seen is my guess) and so the decision was made. We signed up for the “Atlantis Aquaventure” and all were excited for the day. 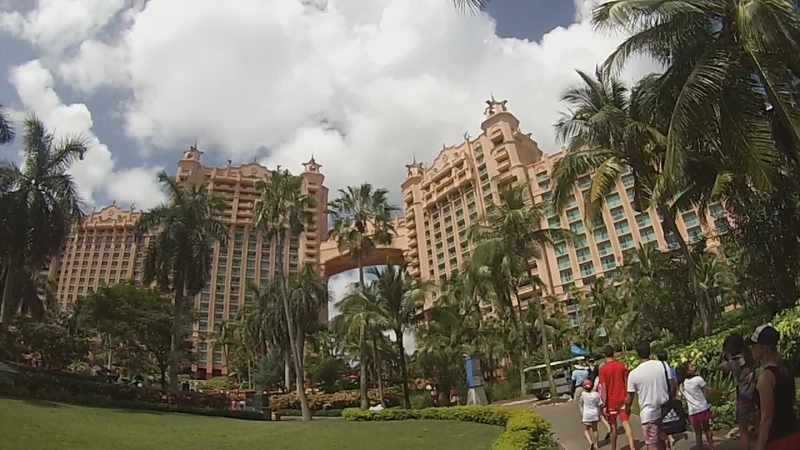 The 4-6 hour excursion included transportation to and from Atlantis, passes to use their water park, a tour of the property, and lunch. Walt Disney Theater. This is where they checked us in and gave us our ‘admission bracelets’ and lunch vouchers. From there we disembarked the Dream and walked through the port till we got to a series of buses, which is where we waited to take the bus to Atlantis. One thing to note is that there was quite a bit of walking involved with this excursion – so I would recommend wearing sneakers or comfortable swim shoes. When we arrived at Atlantis, we were met by a tour guide and given an ‘orientation tour’ of the resort as we walked to the ‘Aquaventure’ water park. I must say that the resort is extremely large but was truly beautiful! 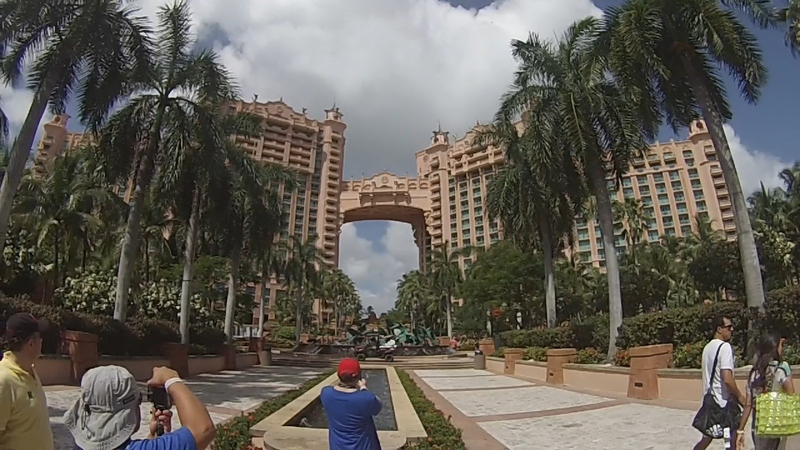 We walked through the huge lobby of the Royal Towers (which is a site to behold in itself), through the hotel grounds and various marine exhibits and over to the water park. The water park is the best I have ever been to. It is 141 acres in size and features state of the art water slides, river rapids, waterfalls and pools. Our personal favorite in which we spent most of our time was their ‘Aquaventure river’ that went around the entire water park. Unlike ‘Typhoon Lagoon’s ‘lazy river’, this one at Atlantis actually uses special escalators and waves to transport you around it. It was a great way to spend a good deal of the day and kept us nice and cool in the hot July sun! Traveling in the ‘Aquaventure river’ is also a great way to see the entire water park and figure out where you want to explore next. After we spent a good deal of time in the lazy river and exploring some of the water slides we got hungry and decided it was time for lunch. The lunch vouchers we were given were good for any one of the quick service restaurants that were located around the water park. The food was pretty standard fare (burgers, wraps, pizza and salads) but it hit the spot. One thing I did notice is that there was not a lot of tables or seating for the quick service restaurants; but, I assume that most people get their food and go back to their beach chairs. When we were done with lunch we hit the water park again. We ended up spending some more time on the Aquaventure river and then the (somewhat) famous water slides that go through the shark tank! The wait times were not very long for the water slides, in my opinion, and there were so many of them it spaced everyone out evenly. Once we were thoroughly waterlogged, we decided we would check out the ‘ruins’ of Atlantis called “The Dig” before heading back to catch the bus. Buses left every half hour back to the port, which was nice, because it really did allow you to spend as much time as you wanted at Atlantis and gave you some flexibility. “The Dig” was an amazing themed walk-through labyrinth of sea life in large viewing windows. The added benefit is that it was cool and these areas were air conditioned which made for a welcome relief from the hot sun. The marine life and presentation was truly wonderful and very extensive. As we made our way out of “The Dig” we walked back through the lobby of the Royal Towers and rested a little in the lobby, taking in all of the grand architecture and design. We then headed back to the bus, where we were brought back to the port, and boarded the Dream again. Atlantis is so large that we could go there again for another excursion and probably not do the same things twice. There are actually many Atlantis excursions to choose from. So if you are not a big water park fan you can book the “Discover Atlantis Tour” and basically walk around and look at the marine exhibits, shop, play at the casino and eat. There are also Atlantis excursions that feature Dolphin interactions at their Dolphin Cay, snorkeling and golf options as well. 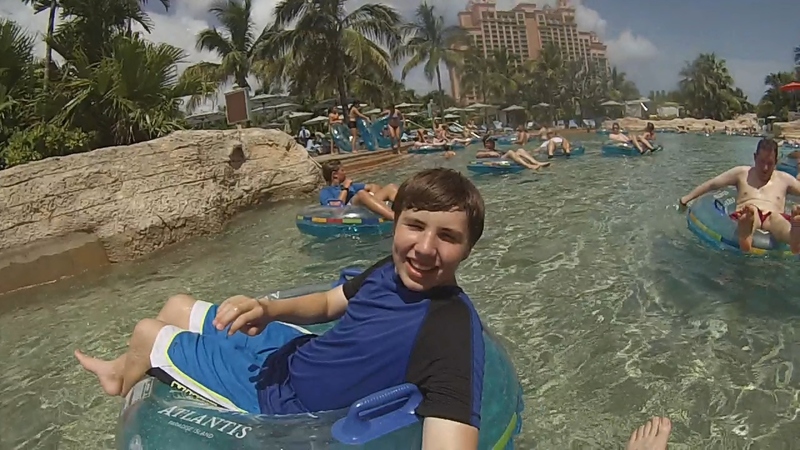 In my opinion the Atlantis excursion was well worth the money –especially if you have tweens, teens or older kids. The orientation tour at the beginning was good for first timers to the resort but a bit long – if I booked another Nassau excursion I would probably bypass the tour. Hands down though, the best part of the day was being able to walk back onto the Disney Dream (we were greeted at the port with ice cold lemon water and frozen facecloths to wipe our faces with – heaven after a day in the hot sun!). Have you been to Atlantis? What excursions have you done with DCL and what did you like best? There are a few choices you can make when purchasing tickets for your next Disney vacation if you are not doing a package. All tickets can be bought from a single day up to 10 days in a single ticket. All tickets must be used within 14 days of first use. The first is the Base Ticket. This is a ticket that allows you to get into a single park per day. If you are doing a one day base ticket and wish to get to Magic Kingdom this park is slightly more expensive than Animal Kingdom, Epcot or Hollywood Studios. A step up from the Base Ticket is the Park Hopper. The Park Hopper allows you to visit more than one park in a day. You can use it to visit all four in a single day or to just visit one. This ticket affords a lot of flexibility in your vacation. You can plan to visit one park in the morning and then go to another in the evening for dinner. Or if you aren’t sure which park your children or you will enjoy most this ticket is very helpful. If you keep finding yourself wanting to go to Magic Kingdom for a dole whip and a spin on the Haunted Mansion this ticket can make that happen. Another option is the Water Parks Fun and More. This ticket option allows you access to Disney’s Blizzard Beach and Typhoon Lagoon Water Parks, Disney Quest, Winter Summerland and Fantasia Gardens Miniature Golf Course, Disney’s Oak Trail Golf Course, and ESPN Sports Complex in addition to your theme park visits. If you purchase a 5 day Park Ticket with Water Parks Fun and More option you can have up to 10 days of fun. Or if you want to visit Blizzard Beach and Disney Quest in the same day this will use 2 allotments of the 5. For a little bit more of a fee you can combine the Park Hopper with the Water Parks Fun and More for a fun-filled visit. 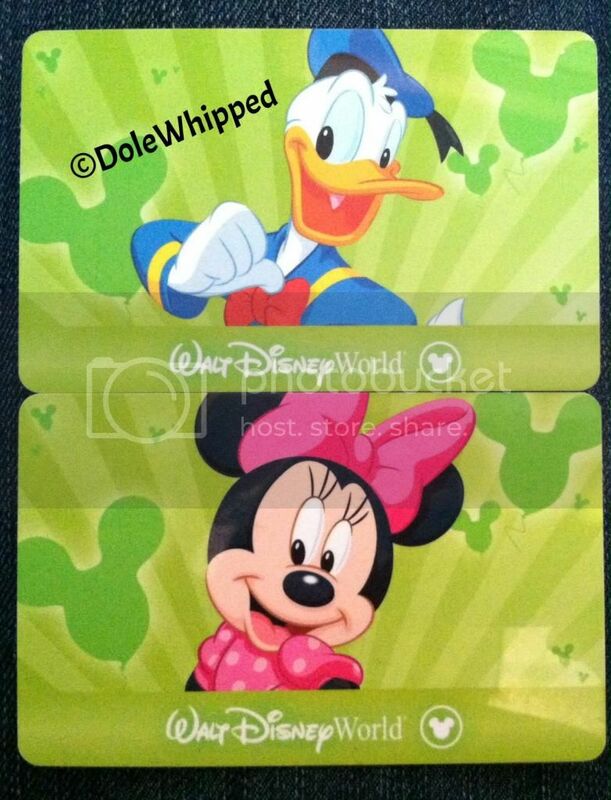 Disney will run specials on Military Salute Tickets. Generally these are a 4 day Park Hopper ticket discounted and have to be purchased on base or at Shades of Green. These do have an expiration date as well. Another way to get discounted tickets is by being a Florida Resident. Details can be found by signing into your Disney account for more information. And lastly if you are planning a vacation that is over 10 day or more than one vacation within a year of each other an Annual Pass might be the correct ticket for you. With Annual Passes there may be black out dates and exclusions so it is always best to check your options before making this purchase. Lastly if you feel you didn’t purchase the correct ticket for you there is always the option of upgrading your ticket at Guest Services in the a parks. You will pay the difference if you choose to add days or the Park Hopper option or even if you are going to upgrade all the way to an Annual Pass it is all possible so you don’t feel stuck with what you have. Sometimes your arrival or departure day in Orlando are short enough that it isn’t worth using a park day. Or maybe you are trying to save some money or save your feet while you are visiting Walt Disney World. Here are some ideas for things to do! 5. Water Park, yes this will cost extra but it might be cheaper than a park ticket. 4. Spa, there are plenty of spas at various Disney resorts. What a way to end a great vacation by relaxing a bit. 3. Golfing, regular or mini golfing, Disney has them both! And this is a lot of fun of adults and kids. 2. Downtown Disney, Splitsville, Disney Quest, shopping, dining, entertainment, La Nouba, Characters in Flight, and a movie theater. Some things are free and others are paid but it is a great way to fill time without having to visit a park. 1. Resort Hopping, this one is free and it gives you a chance to check out other resorts that you might want to stay at for your next vacation. You can catch activities, a movie, campfire, or some entertainment if you time it just right. Just know that there is no resort to resort transportation so you will have to drive or take a bus to the nearest park then take another form of transportation to get to the resort. 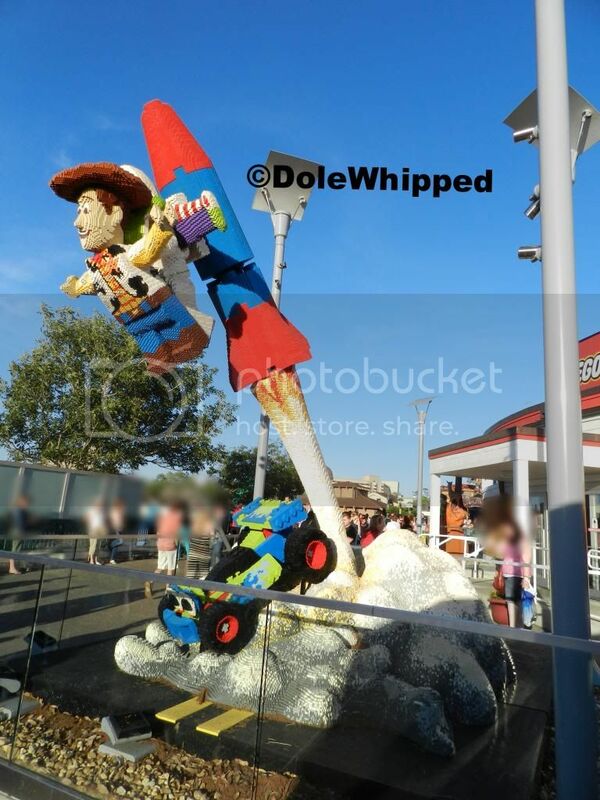 Disney is always working on something in the parks. Here is the up to date list of refurbishments and closing at Walt Disney World. There is a lot of construction work going on at Downtown Disney and roadwork done. Expect delays when driving. As always these are subject to change at any moment without notice. Disney has recently updated its refurbishment list and dates for Walt Disney World. You are going to want to check these out if you are going this summer and fall. 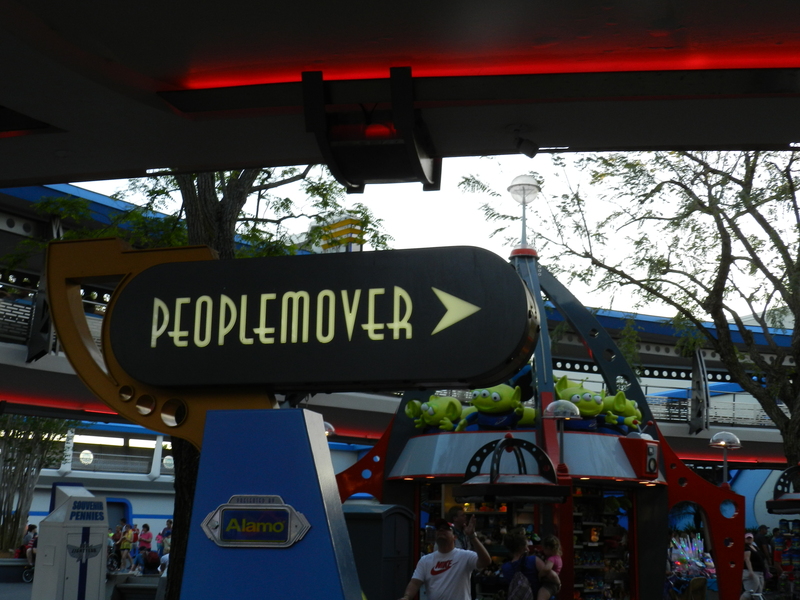 Magic Kingdom: Tomorrowland Transit Authority – Peoplemover- June 2 – August 4, 2014 Astro Orbiter -June 2 – September 19, 2014 Liberty Square Riverboat -August 4 – 8, 2014 Mickey’s PhilharMagic- September 8 – 19, 2014 Carousel of Progress- September 22 – 27, 2014. Great Ceremonial House, the atrium is being reimagined to highlight the cultural elements of Polynesia and provide more expansive views. At certain times of day, there may be some noise and alternative paths of travel may be needed throughout the Great Ceremonial House. Nanea Volcano Pool and Slide. The main pool and slide will be closed for enhancements. Guests who stay at Disney’s Polynesian Resort while the main pool is closed will receive one complimentary ticket for each member of their party to visit Disney’s Blizzard Beach Water Park during their stay. We will keep you updated with any changes in closures or dates!